Buttertubs Marsh is an oasis of stillness and birdsong, just minutes from downtown. There is a beautiful 2.4 km loop of wide trail (with narrow gates to prevent motorized vehicles) around a body of water buzzing with activity. There are viewing platforms for watching the wetland's denizens. This is a bird sanctuary, and it also has turtles! My favourite subdivision near Buttertubs is the Garner Crescent area on the hill looking south and west over the marsh to Mount Benson - it's a stunning view! 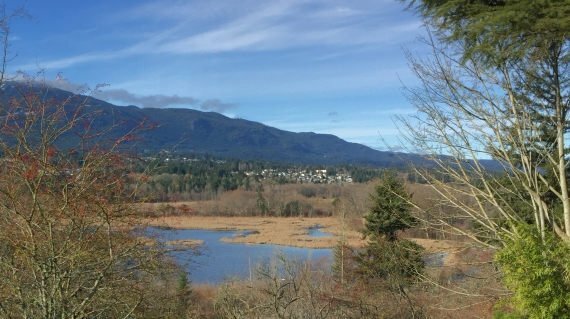 The newer Hawthorne neighbourhood is also close to the marsh, and many homes have great mountain views.